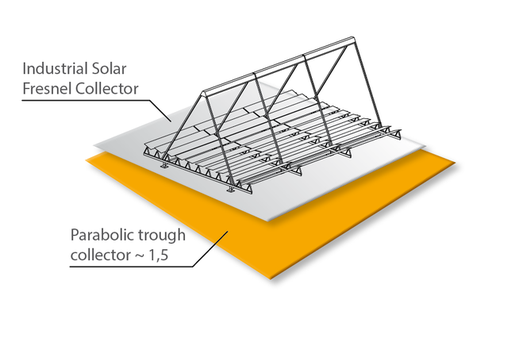 The Fresnel Collector is a linear concentrating, solar thermal collector optimized for industrial applications. It can provide heat at up to 400°C and operate with pressures of up to 120 bars. Besides water, thermal oil or high-temperature glycol it can also generate steam directly. 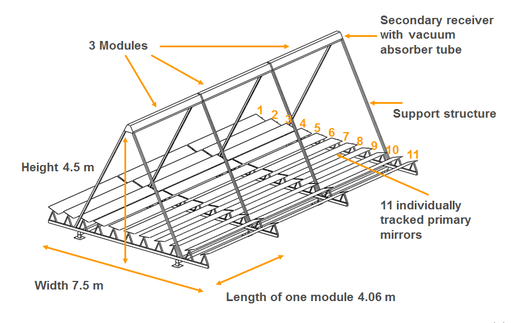 Due to its modular design, the system can be scaled up from a 500 kW to 30 MW. How Does A Fresnel Collector Work? Direct solar radiation is reflected on several rows of single-axis tracking mirrors on to a stationary receiver. This consists of a highly efficient vacuum tube with selective coating. The heat is collected in this absorber tube and fed to the application by means of a heat transfer medium. A part of the sun light reflected by the primary mirrors hit one of the secondary mirrors positioned above the absorber and is reflected from there on to the absorber. What Are The Advantages Of The Fresnel Collector?